Studying abroad doesn't have to break your bank if you choose to study in Malaysia. Here's an overview of how much (or how little) you can expect to spend on every month. One of life's most valuable lessons you will learn as a student staying away from home is how to balance your bank account every month. Though you will still need to pass all those compulsory modules to get the credits you need to graduate, making sure that you're within your budget every month will ensure that you get to remain in college. 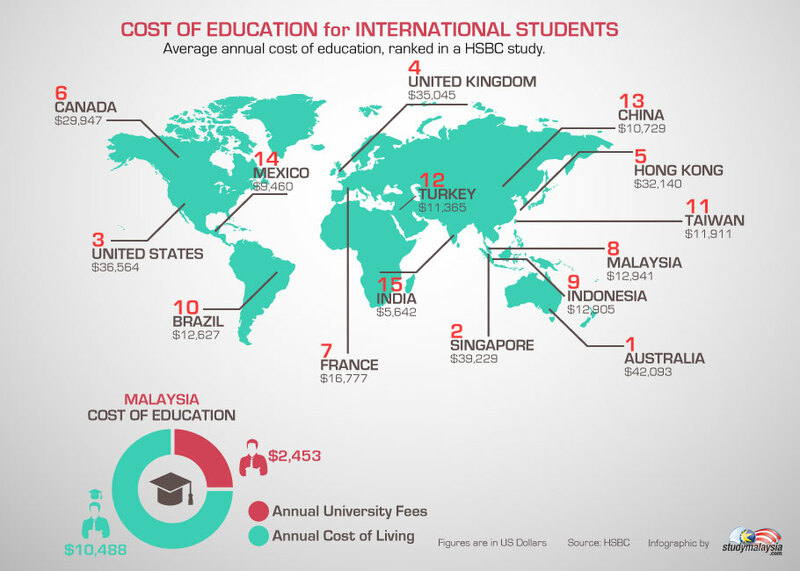 A major advantage for international students who choose to study in Malaysia is the relatively reasonable cost of living. The total expenditure for accommodation, either on-campus or off-campus is very affordable. While your actual cost of living will depend on the location of your accommodation and your personal lifestyle, students will be pleased to know that Kuala Lumpur has been ranked the most affordable city for students 2014. For most students, a monthly budget of RM1,500 (US$469) will provide them with a rather comfortable living in Malaysia. So what are the things you should include while planning your monthly expenditure? You should estimate about RM300-600 (US$94-188) for your accommodation per month. The rental will vary depending on the geographical area, the type of accommodation (on-campus living in a hall of residence; or off-campus living in an apartment, condominium, single-storey house, double-storey house, etc. ), the facilities provided in the house (e.g. with or without air-conditioning) and of course, the number of people sharing the room (or apartment or house). Your food and housekeeping expenses are estimated to be around RM450-600 (approx. US$140-185). This is based on about RM15-20 (US$4.60-6.20) for three meals per day. Naturally, it would be cheaper if you cook and share the cooking expenses with your friends. Your clothing expenses like washing, ironing and dry-cleaning may cost around RM60 (US$19) per month. Students who stay on campus or near campus may not incur any cost of travelling to and from classes. However, other travelling may cost approximately RM30-50 (US$9-16) per month. The mobile phone packages in Malaysia are very competitive. How much you spend will depend on your usage and the promotional package you choose. The average student may spend about RM30-80 (US$9-25) per month. The estimated cost of books and stationery should be around RM50-100 (US$16-32) per month, but it would largely depend on the course you have signed up for and the number and nature of projects in your course. Although you may not need to pay for medical expenses every month, if you put aside RM50 (US$16) per month, it would be sufficient for you in case you need outpatient treatment at a private clinic during the year. This estimate does not include the amount you will have to pay for your medical and hospitalisation insurance of about RM500 per year. Your monthly personal expenses largely depend on your personal lifestyle. However, the cost can be estimated to be between RM100 (US$32) and RM200 (US$64). This includes your socialising needs, toiletries, haircut, clothes, movie, etc. Using the estimate above, the total cost of living for a student will average at RM1,500 (US$469) per month or RM18,000 (US$5,625) per year. It is important to remember that the above estimate is only a guide in planning your budget to study in Malaysia and geographical location and personal lifestyle should be factored in when planning your personal budget. This article is a preview from "Cost of Studying and Living in Malaysia, Chapter 7" of Study in Malaysia Handbook (9th International Edition) which will be released in November 2014. Study in Malaysia was first launched in 1998 along with the website www.studymalaysia.com and provides useful and important information for international students who are considering studying in Malaysia. Click here to find out more about other publications for international students.